Welcome to Dane Reid Media (DRM). DRM offers exciting services and advertising solutions. No product in the world has ever been sold on television or radio without a professional voiceover talent. A voiceover talent is the salesperson that intrigues the customer and pitches the product or service before the sales staff can go to work. To do this, you’ve got to have the right voice representing the product or service. Dane Reid Media (DRM) uses premiere voice talent, Dane Reid, to advertise your products and services and offers several promotional solutions in which a professional voice can help your business. DRM offers a variety of traditional services to radio advertising. Radio is a medium in which the product cannot be seen or touched. Therefore, the voice representing it must be powerful, evocative and draw the consumer in . DRM will produce your 30-60 second radio spots ready for airing. DRM also serves radio stations by providing voice tags and recording Public Service Announcements (P.S,A.s). DRM will partner with your production team to provide you with the best in voice over services for your television advertisements . DRM also offers narration for movies, documentaries, training videos and video presentations such as those for stockholders. 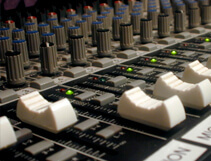 DRM also provides the voice for animation, product infomercials and company press releases. The Internet has long been a place for boring text and pictures. The most effective sites on the World Wide Web offer consumers a full experience, rich with graphics, copy and sound . DRM helps you do that by recording Dane Reid’s voice talent for upload to your web pages. Your website will be enriched with a voice that welcomes your users, navigates web surfers through your site and promotes your products in a unique way. Visit other sites and compare them to DaneReidMedia.com to experience the difference a voice-navigated site can make. DRM provides the voice for answering services, on-hold ads and on-hold announcements. With the help of our partners Business Support Services, Inc., DRM also offers a unique way of advertising through the use of the telephone. This service broadcasts voice notifications to your clients, employees, family, friends and anyone else you may have on the telephone! These notifications vary from simple messages to radio quality commercials. Business Support Services, Inc. uses Dane Reid Media exclusively for all of their voice service notifications. Dane Reid is not only a voice talent for all of your advertising needs, but is also a professional Announcer, Master of Ceremonies and Speaker for your events. Contact DRM for more information on these services. DRM offers voice talent, but also has excellent writing capabilities as well . Using DRM to write and record your commercials cuts out the costs associated with expensive advertising agencies. DRM will discuss your project with you and will script original ideas to fit your needs. DRM scripts commercials, articles, short stories, bios, album interludes and spoken word pieces.